PenDelfin block mounted print, The Auction. The PenDelfin Studios produced a series of only three wall mounted pictures all of them illustrations from different PenDelfin storybooks. They were only produced from c1989 until 1994. 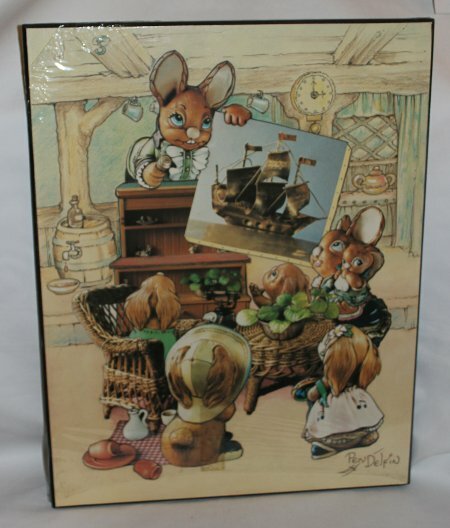 This PenDelfin picture measures approximately 46cm tall, 35½cm wide and 1cm deep and is designed as a block mounted picture to be hung directly onto a wall using the hook hole in the back of the picture. This PenDelfin picture has its original cellophane over most of the picture with just a little uncovering on one of the top corners. It still has the PenDelfin label on the reverse describing which PenDelfin story the illustration was taken from. 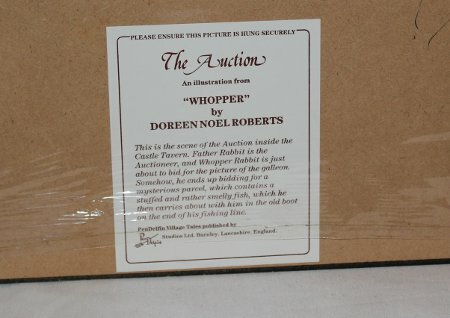 This PenDelfin block mount is called The Auction and is an illustration from Whopper by Doreen Noel Roberts.